This is a call to all helping adults working with teens! Let’s do this work so that we make a meaningful and positive impact on the youth we serve! Today’s adolescents are our future. They rely on us – the adults in their lives – to teach, through collaboration, modeling and example. We must demonstrate Respect, Authenticity, Predictability, Kindness, and Acceptance along the path toward growth and change with adolescents. Whether teaching, coaching, counseling or mentoring, your relationship with teens matters in your work. Join us as we change the paradigm to improve outcomes with the youth we serve and enjoy our own well- being as a result. We may recall stories from our teen years of authoritative, ineffective adults. Thankfully, many of us also remember one or two adults who made a positive and profound impact. Which adult do you want to be in the lives of teens you serve? Changing a Generation… One Relationship at a Time!! Changing brains, challenging personality traits, and shifting social and developmental expectations. This is the world of a teen. Use this understanding to gain skill in understanding WHY teens do what they do. Get inside the mind of a teen and see the world through their eyes. Use this insight to understand exactly why it is tough to connect with teens and maintain credibility. Learn how to step out of adult stereotypes to start connecting. Relationships matter. Research and experience bear this out. Use your connection to build powerful relationships with the adolescents you serve. Make a difference for a young person! Learn about the incredible value of respect – the deep experience and communication of another’s inherent worth. See the research about why it works, discover how to find and express respect for even the most challenging kids, and develop skill for demonstrating respect consistently and effectively to improve the relationships with those you serve. Learn about the compelling power of being real, open, and sincere. Discover why this is so critical with adolescents, and gain skills for mastering the balancing act of being authentic while maintaining professional boundaries. Learn how simple acts of kindness grease the wheels of collaboration with adolescents and solidify your relationship with the teens you serve. Mastering the balance of expressing understanding and holding the line gives you the ability to challenge teens to reach their goals. Did you know that predictability feeds innovation? Learn how in this chapter. By remaining consistent and predictable with adolescents, they are able to take risks in learning and self-reflection. Your stability can make an enormous difference in their achievement. Ever find yourself baffled by and thus unable to accept an adolescent’s behavior? Learn how acceptance is a necessary step toward change and the skills necessary to arrive at a place of acceptance. It can be especially difficult when we disagree with a teen’s choices AND imperative if we intend to have any meaningful impact. What is it and how does it work? Learn the stages of change and how to pace yourself when adolescents are in a different stage of readiness. Learn how combining the skills from other chapters facilitates movement toward change and positive outcomes with youth. Here is where we will inspire you to take the skills we offer and change the culture of our work with youth! Be the adult that makes a positive impact in your work with teens one relationship at a time. In What Works with Teens, Rathbone and Baron have pulled back the curtain on relating successfully with teenagers, and ably demonstrate the understated yet incontrovertible power of thoughtfulness, graciousness, and courtesy in influencing behavior change among youth. These authors understand what teenagers have always known but have been unable to articulate: that what really makes us credible and trustworthy as mentors, helpers, and sources of inspiration doesn’t derive from our pointed explanations or advice, but rather from our ability to make a young person feel validated and respected in our presence. … This is a terrific book, deserving of attention from therapists, counselors, parents, coaches, and the people teaching our next generation of mental health providers. I know of no other book like it and consider it a very valuable addition to the literature on counseling, parenting, teaching, and simply caring for adolescents. 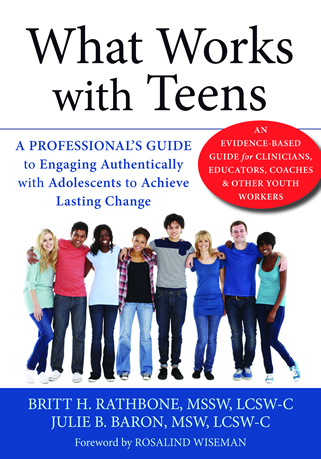 What Works with Teens is a gift to clinicians—simply a must-read! Offering tremendous insight into the world of the adolescent and adolescent brain, it invites clinicians to thoughtfully approach their work with teens and, in particular, how to facilitate a meaningful and effective relationship. Based on science and the authors’ clear mastery of treating teens, this book provides a comprehensive and sophisticated understanding of what is needed for successful work with teenagers. Presented in a clear and engaging manner, What Works with Teens will leave the clinician prepared and inspired. In their wonderful new book, What Works with Teens, Britt Rathbone and Julie Baron write, ‘Working with adolescents is a calling. If we are going to make a difference in the lives of youth, we need to roll up our sleeves and be ready to dig in with our whole selves.’ In this era of neurobiology and competing therapies, Rathbone and Baron remind us to pick up our heads out of the evidence-based manual, look at ourselves in the mirror, then look into—and through—the eyes of our young patients. This book represents a rallying cry and a detailed road map. Rathbone and Baron discuss why and how to reestablish the relationship at the center of our work with adolescents. As they write so convincingly and practically, we can only help adolescents change and grow through relationships based upon respect, authenticity, kindness, predictability, and acceptance. This book is realistic, wise, and inspiring. I will recommend it to young professionals-in-training and experienced colleagues. I'm also sure to reread it on days when I need to take a step back and remember why we do this work—and how fortunate we are to do it. Sadly, most of us are lucky to have had one or two adults who had a memorable positive impact on us during our adolescence. And many of us have had more than our share of the teachers, coaches, therapists, doctors, etc. who we really disliked. This just isn’t right! Things need to change. We set out to identify the characteristics that differentiate the life changing adults from the others. We talked with hundreds of young people, helping adults, and then we dove into the research. Think back to when you were a teenager . . . was there an adult in your life who you really disliked? Maybe a particular teacher, coach, or neighbor? What was it about that person? Why was their impact on you so great that you still recall their interactions? Isn’t it incredible that out of all the people who have come and gone over the years, you can still recall this one so clearly? Do you think they still remember you? Now switch gears . . . think about an adult in your life that really made a difference. Someone who had your best interests in mind, believed in you and communicated it consistently. What was it about this person or mentor? What did they do that made them stand out? Julie Baron introduces the release of her new book (co-authored with Britt Rathbone) by discussing critical skills sets for developing and maintaining effective working relationships with adolescents in a variety of settings. Julie Baron discusses how the various elements of social culture and developmental needs guides teens in their attitudes, beliefs and behaviors about peer relationships. Julie Baron talks to parents and professionals about what motivates teens to engage in their friendships and in bullying behaviors. Britt H. Rathbone is an adolescent mental health expert and is the director of Rathbone & Associates, an adolescent psychotherapy practice. Mr. Rathbone earned his social work degree from Columbia University and has worked exclusively with adolescents and young adults for three decades. In addition to his clinical work he has been a highly rated instructor of graduate social work students at the National Catholic University School of Social Service. He trains therapists and presents frequently to lay and professional audiences on issues of adolescence. He is committed to providing treatments that work for young people, and training service providers to do the same. In addition to What Works With Teens his publications include Dialectical Behavior Therapy for At-Risk Adolescents: A Practitioner’s Guide to Treating Challenging Behavior Problems, and Parenting a Teen Who Has Intense Emotions: DBT Skills to Help Your Teen Navigate Emotional and Behavioral Challenges. He is consistently named a top therapist for teenagers by Washingtonian magazine. is a clinical social worker with twenty five years of experience working with adolescents and their families in community based mental health centers, residential treatment facilities, home based crisis stabilization programs, public and private schools, and is currently in private practice providing individual, group, and family therapy and advocacy services at Julie Baron and Associates in Rockville, MD. Ms. Baron earned her social work degree from Boston University. She practices evidence-based relational strategies to engage adolescents in intervention and empower young people in reaching their goals. She has particular knowledge and experience in understanding different learning styles and disabilities as well as a variety of emotional and behavioral issues affecting children and adolescents. She has written articles and provides trainings and workshops to adolescents, parents, and professionals on various topics related to adolescent development and social culture, such as bullying and cyber-socializing, positive school climate, and practicing therapy with adolescents. She is the co-author of “What Works With Teens: A Professional’s Guide to Engaging Authentically with Adolescents to Achieve Lasting Change” released by New Harbinger Publications on April 1, 2015.